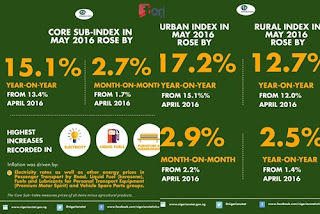 The Consumer Price Index (CPI), which measures inflation, rose by 0.9 percent to 16.5 per cent in June compared to 15.6 percent in May, according to the National Bureau of Statistics (NBS). This is the fifth consecutive month that the headline index would increase relatively strong. The increase in the month under review was attributed to energy prices, imported items and related products which continued to be persistent drivers of the core sub-index. According to the CPI figures for June, which was released on Monday by the statistical agency, the highest price increases were noticed in the electricity, liquid fuel (kerosene), furniture and furnishings, passenger transport by road, and fuels and lubricants for personal transport equipment.